Seniors looking to make changes can improve the quality of their lives in many ways. With exercise, nutrition, regular medical and dental checkups and staying social, seniors can make inroads with their longevity. Plus, incorporating healthier habits can lead to a happier, healthier body. If you’re ready to make some changes, read on for tips to get the health boost you need. Proper oral health is paramount when aiming for overall health, and it’s especially important for seniors. Ignoring mouth health can lead to a host of health problems, like heart disease and even diabetes. Plus, our oral health is connected to heart health, digestive health and even our mental health. Make a point to brush and floss every day, particularly after eating any sugary foods. Also be sure to schedule two dental visits each year. This is especially important if you have a Medicare Advantage plan with dental coverage. You’re already paying for it, so use it! A nutritious diet is another great way to aim for a healthier lifestyle. The USDA has excellent information on healthy eating guidelines for Americans. The Choose My Plate website features information on all the food groups, along with recipes and ways to connect with farmers’ markets in your state, so you can easily find local, healthy food. It’s best to eat a variety of foods so you don’t get into a rut. If you get bored with your choices at home, it’s easy to opt for fast-food or pricey takeout with empty calories. Nutrition experts recommend five or more servings of fruits and veggies daily and about five to six ounces of protein each day. Add spinach to your morning omelet, have a salad at lunch, and eat lean protein like salmon for dinner. Poor digestive health can disrupt sleep, cause skin issues, and contribute to depression and anxiety, among other physical symptoms. Making some changes to your diet may be necessary to improve your gut health. to regulate the good bacteria in your system, consider adding fermented foods, such as yogurt, sauerkraut, or kombucha to your diet. Also, a daily probiotic can be a good addition to your eating plan. Both of these options can help with regularity, which is essential to maintaining the balance of good bacteria in the gut. Stress can be devastating to your health. It can keep you from sleeping well, cause you to feel fatigued all day and find it difficult to concentrate on tasks. Managing stress may require some creative thinking, but there are plenty of ways to do it. Eliminate stressors in your home like clutter and disorganization. Add more self-care to your weekly routines — a massage can do wonders, as can meditation, listening to soothing music, and aromatherapy. Even a daily walk around the neighborhood or even a nearby park can also be a great way to remove stress. 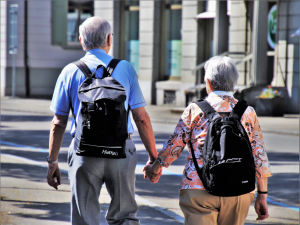 Speaking of walking, daily exercise is a cornerstone when it comes to healthy habits for seniors. Make a point to exercise every day. If you’ve been a lifelong runner, by all means do so, but try countering it with yoga or tai chi so you include some low-impact fitness. If you’ve been sedentary for a while, consider taking up a fitness class or starting a walking plan. It’s important not to overdo it, however, so speak to your doctor before embarking on a fitness plan. And don’t forget to check your healthcare coverage. If you’ve got a Medicare Advantage plan, you could have free access to Silver Sneakers groups in your city. It doesn’t take much to add health-boosting improvements to your life. With proper exercise, healthy eating, stress reduction and regular checkups, you can pave the way for many great years to come.